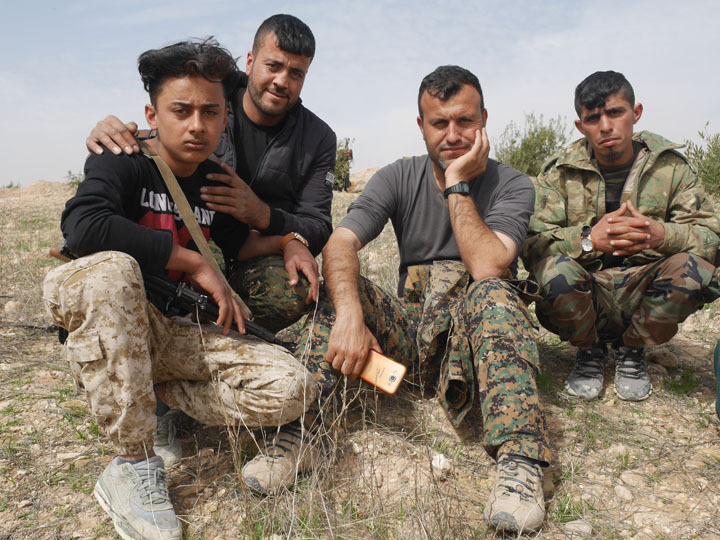 Manbij- Along the Manbij Military Council’s mostly quiet frontline with the Turkish military and its Islamist Syrian Arab proxy militias, headlines have emanated from this mostly misunderstood crisis locus. One of the most crucial points which I personally found maddeningly frustrating was that Turkish president Erdoğan’s constantly parroted talking point that the Kurdish YPG militia must withdraw unconditionally west of the Euphrates River. This ultimatum is designed to meet Ankara’s narrow, localised geostrategic demands that what it deems the “terror corridor” of northern Syria must be cleared of “terrorists” on conditions dictated by the Turkish president and his obedient foreign minister. This assertion was repeated by Western media outlets with global reach in such a blatantly unexamined manner. Some of that may have to do with outlets being risk averse when it comes to hiring freelancers in Syria specifically I would guess from the beheading episodes of 2014 though no one has ever actually told me this in writing, but it seems implied. One major US outlet told me they refused work from independent journalist working in Iraq and Syria in 2017 when I was covering the Raqqa offensive. At the time I presumed this because a freelancer they’d hired was kidnapped/captured though the editor I corresponded with then left me to make merely an educated guess. Thus an intensely complicated place like Manbij that requires immense nuance and time spent has not been aided by fleeting coverage in the mainstream media. This has helped advance the Turkish position on the matter–at least in terms of rhetoric-as-news-copy–coupled with the anti-intellectualism of a bumbling American leader repeatedly contradicting his own field commanders who partner with the Manbij Military Council. Thus I digress. 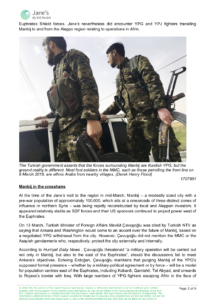 In an effort to examine battlefield nuance, I have an article in the April issue for Jane’s Intelligence Review (subscription required) titled “Strategic Prize” as well as its companion online piece, “Diverse forces converge on Syria’s Manbij,” reporting from the frontlines of this incredibly complex threat environment. 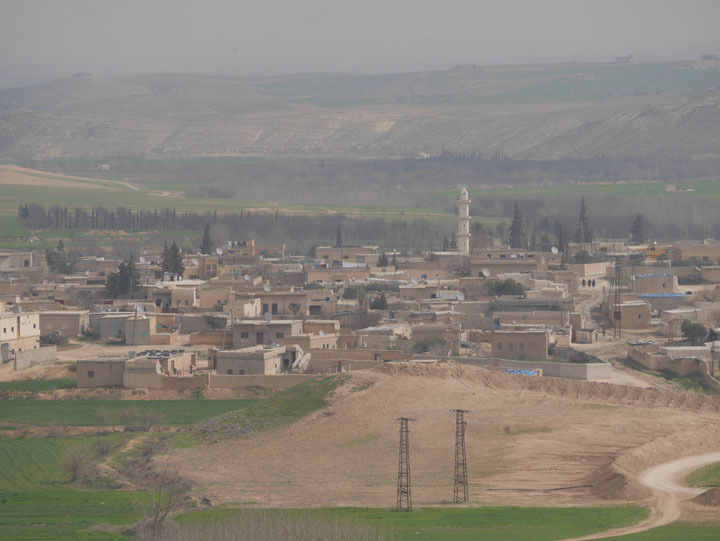 Manbij and its rural hinterland are in fact defended by the Manbij Military Council, a mostly young Arab force helmed by veteran Kurdish commanders that in reality not simply a branch of the YPG. Like the YPG it is a constituent militia making up the SDF but it is a distinct force grouping with a high degree of operational autonomy. The late Abu Amjad who led the MMC was in fact a Manbiji Arab. The MMC does not have female YPJ fighters along its frontline positions facing Ankara’s ‘Euphrates Shield’ forces or those areas where it is facing the Russian and Iranian-backed nizam (Syrian colloquial Arabic denoting the Assad regime). Manbij was a logistical resupply hub for Kurdish militias during the siege of Afrin to be sure but I never observed that they were responsible for this critical frontier city’s armed security. Few independent journalists have actually visited Manbij and spent real time here but understandably so. Aside from a very brief dog-and-pony show with a not particularly articulate American general in early February, the coverage of this incredibly intricate battle space has been lacklustre at best. Though I also must emphasise just how difficult it has become to get not only into Syria but to get access to the core of the stories there. One must deal with the opaque decision making processes of not one but two internationally unrecognised governments whilst in a constant pursuit of freshly stamped permission papers with expiration dates. Having worked in Syria before in no way means working there the next time will be more easily facilitated either. Generally speaking, it doesn’t get easier. But then if things like this were easy and obvious I probably wouldn’t be pursuing them in the first place. In my entire career now spanning some 17 years I’ve yet to do an embed with a Western military and the possible self censorship such endeavours entail. I focus on the doings of indigenous non-state actors such as those of the Manbij Military Council pictured at the top of this post. People from the land they are striving to protect. To me that is and has always been the real engine of these stories. Occupation forces invade and inevitably withdraw in the Levant, even if that takes decades (think Syria and Israel in post-civil war Lebanon per example) but local fighters are fighting for and guarding their own territory which involves a completely different war fighting perspective.